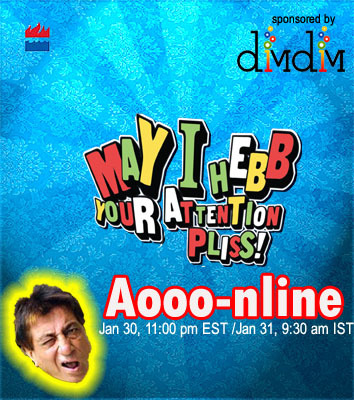 This is a reminder that “May I Hebb Your Attention Pliss”‘s online event will be held on Saturday January 30, 2010 at 11:00 pm Eastern Standard Time which is 9:30 am Indian Standard Time on Sunday January 31 (Please note the difference in dates due to time difference). You only need an email id to register. Once inside the conference, we can discuss any and everything—from book, to the blog from KKR to KRK. Here is the link to the meeting that will be active during its duration. The link to the Kolkata event is here. Please do sign up (not mandatory) if you want to drop by. And here also is the link to the Delhi event. O great bong, My apologies that I cannot come the online event too as I have to go watch the ozzies kick Pakistan in the 5 and the final one day international match. Good luck O great Bong! Im waiting for the book launch meeting in next few months.I would really like to have a conversation. PS:Keep posting movie reviews Da. We really drool over them. I shall look forward to the meeting. Sounds fun to me. It would be great to have a live interactive session. would be plissed to be there 😀 but it would 5 in the morn here in Zurich 😦 Will try to login by 7. Not fair! I want an event in Hyderabad also! For all answers, please visit https://greatbong.net/book Short answer: Book is to released end of February. hey gb, there was a post you wrote’Indian Institute of International Dreamers’ ..did u delete it ? coz it does come up by google if i search but can’t find it on this blog? I enjoyed your web meeting this evening. I wish you all the best with your book, and look forward to reading it soon. it was a great experience talking to you in person…and wish you hold more such online events! Would eagerly wait for your mahabharat comic strip..
@min he might have had to remove it to put it into his book..